In preparing the patties, I have tried all sorts of “add-ins” to mix with the beef – everything from dried onion soup mix, to eggs, to bacon fat, to grated cheese . The absolute best to add is…nothing at all! Why dilute that pure beefy taste? When making your own hamburgers, start with 1 ¼ pounds of ground beef with 20% fat content. This will be enough for four big patties. Normally I buy a lesser fat content, but for really tasty burgers, get the 20%. (Using clean hands!) Divide the beef into four sections. Gently form each section into a round “patty” shape. It’s not necessary to tightly pack the beef into shape. In fact, you should try to handle the beef as little as possible. Each patty should measure approximately ¾ inches thick and 4 ½ inches across. Wrap the extra patties in plastic wrap and freeze them for next week’s dinner. Before you start cooking the hamburgers, toast the cut side of the rolls. (Untoasted rolls get soggy very quickly.) Lay the rolls out on a baking sheet with sides and put them under the broiler. 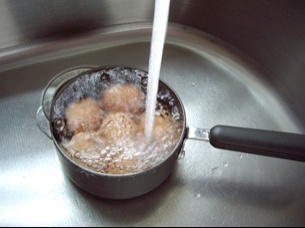 Preheat your fry pan (on medium- high temperature) by putting a few drops of water in the pan. 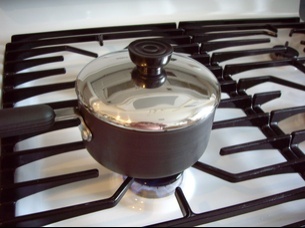 By the time they have evaporated, your pan will be hot. Make sure the fry pan you are using is large enough to hold your hamburgers without squishing them together. Cook the hamburgers (on medium-high) on one side then flip them once, and then cook them on the other side. If you want to make a cheeseburger, place a slice of cheese on the flip side about 1 minute before the burgers are done cooking. The heat from the hamburgers will melt the cheese. Serve your hamburgers with sliced tomatoes, lettuce, a dollop of mayonnaise and some salt and pepper. Add some variation to your hamburger recipes thanks to this Tex-Mex cheeseburger video! Rare, medium or well done Hamburgers? The USDA recommends that you always cook hamburgers so that the internal temperature reaches 160 degrees which is well done. When I’m making deviled eggs for a buffet table, I sometimes think perhaps they are a bit old-fashioned and outdated. Then, when the party is over, the deviled egg platter is always empty! To make deviled eggs, in addition to the eggs, you will need mayonnaise, mustard, salt and pepper, and green olives stuffed with pimentos for flavor as well as garnish. 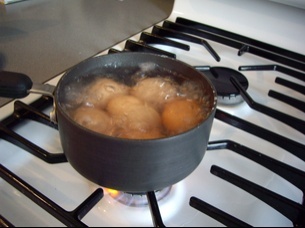 The first step is to hard-cook (what some people call ‘boil‘) six eggs. 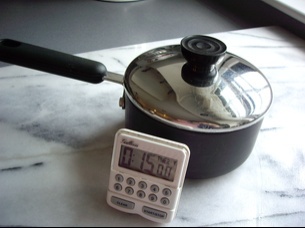 If you are unsure of how to boil an egg, check out my 30 second video for a quick review! 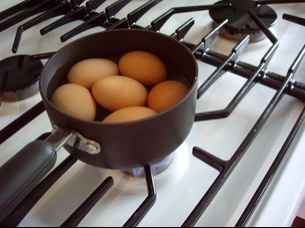 If you’ve just cooked the eggs, let them cool to room temperature before peeling them. 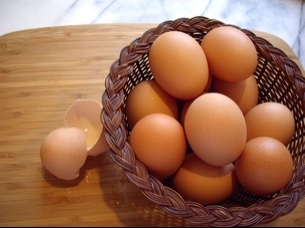 Actually, cold, hard boiled eggs, just out of the refrigerator, are much easier to peel than just cooked eggs. 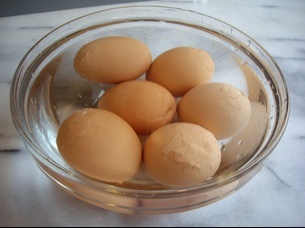 If you are having trouble peeling the eggs, crack the shell at the ends of each egg and put them in a bowl of ice cold water. 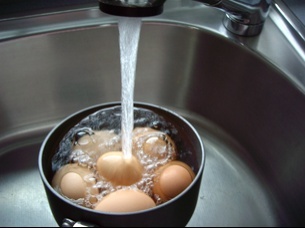 Let the eggs sit in the cold water about 10 minutes. This allows the water to seep in and make peeling much easier. Once all the eggs are peeled, slice them in half lengthwise. 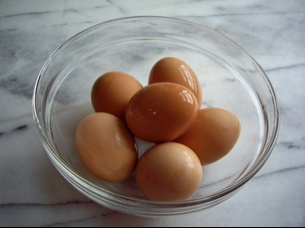 Using a spoon or a fork, gently remove the yolks from the whites and place the all the yolks in a bowl. Set the whites on your serving dish. I’m using my deviled egg dish which has grooves in it to hold the eggs in place for serving. If you do not have a deviled eggs dish you could put them on a bed of washed parsley so they not only look festive but the parsley will also prevent the eggs from sliding all over the place. To make the filling, mix together the 6 yolks, add ¼ cup of mayonnaise, 1 ½ Tablespoons of mustard, and a sprinkle of salt and pepper. With a fork, mix all of this together until it’s smooth. Taste it to make sure it doesn’t need more salt. Sliced olives with red pimentos are a traditional garnish for deviled eggs – plus it’s a great flavor combination. A sprinkle of paprika, if you have some in your spice cupboard, is also a lovely garnish on deviled eggs! Deviled eggs make a great appetizer and a perfect party dish. P.S. 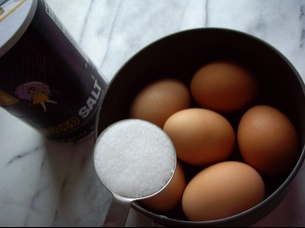 Once you have mastered making hard boiled eggs you might want to give an egg salad sandwich a try!